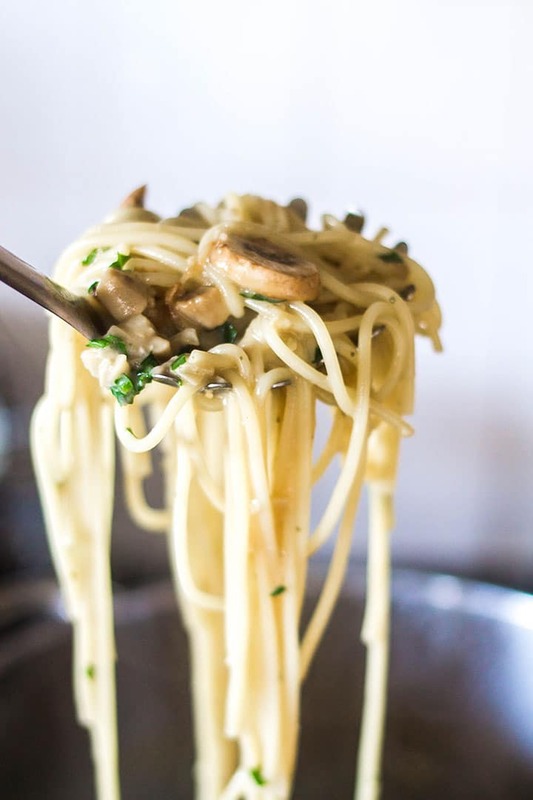 This luxuriously creamy mushroom spaghetti recipe is quick, easy, and perfect for those weeknight meals. 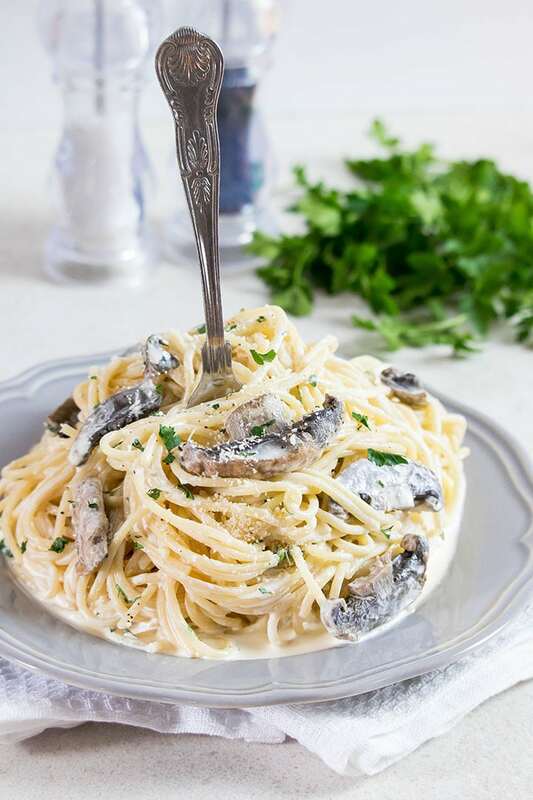 This easy, delicious creamy mushroom spaghetti recipe is made of sautéed mushrooms and pasta in a garlic cream sauce that’s a perfect weeknight dinner! Looking for a delicious, filling dish the whole family can agree on? 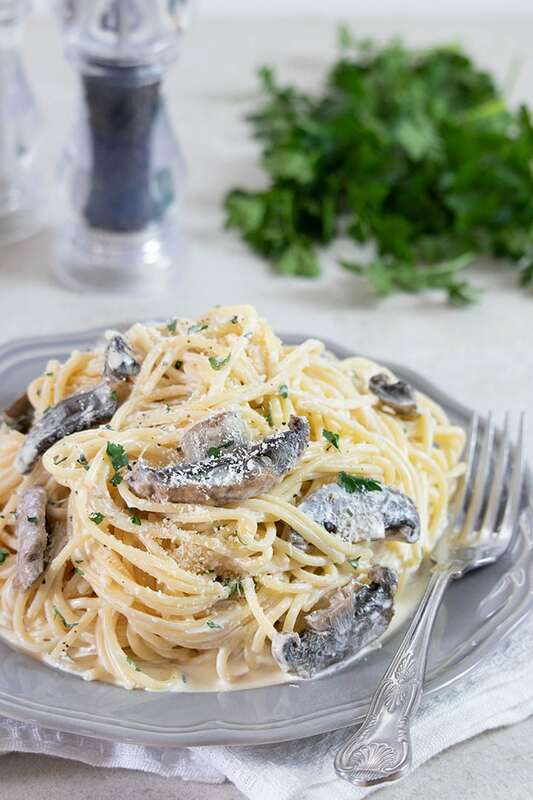 This creamy mushroom spaghetti has definitely got you covered! 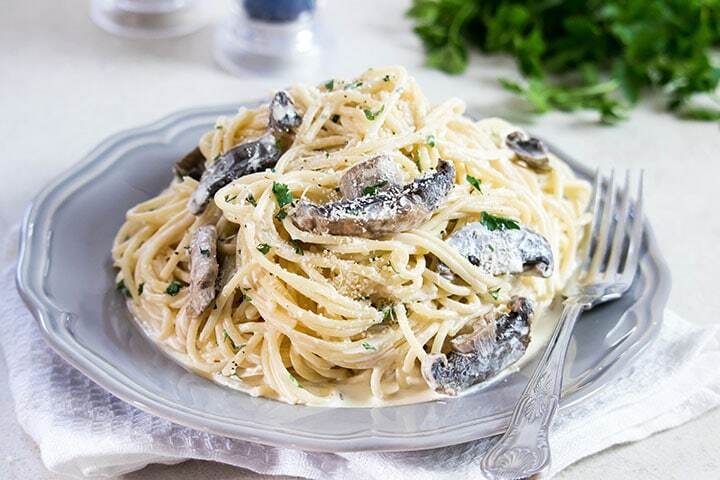 This dish uses simple ingredients – mushrooms, garlic, shallots, cream, parsley, grated cheese and a bit of salt & pepper. 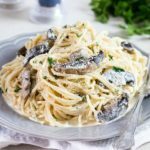 With this recipe, you get a creamy sauce with plenty of fresh mushrooms and garlic tossed with spaghetti and topped with grated cheese. It really doesn’t get much better! It takes no time at all to throw together and goes from stove to plate in only twenty minutes. The creamy sauce and meaty mushrooms make this a hearty meal. This very economical dish is full of flavor without breaking your budget. To me, there are very few things better than a big bowl of pasta, and this creamy, comforting spaghetti dish is no exception. I loved it so much that I would gladly welcome it into my weekly rotation! It was so good that my husband wouldn’t stop raving about it. Start with cooking the spaghetti until just undercooked. 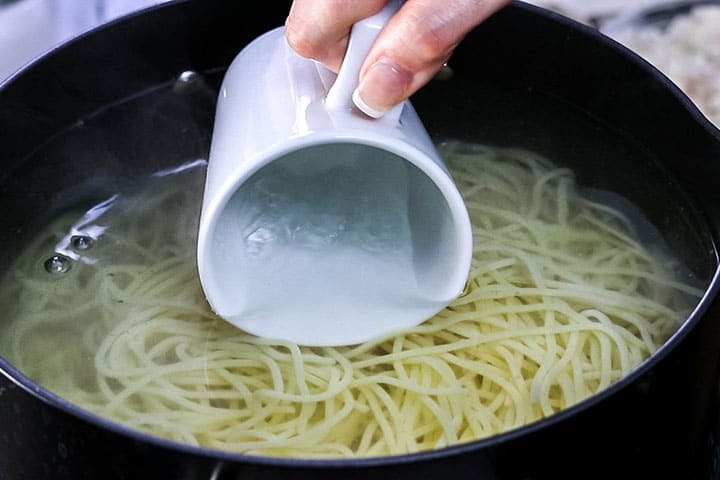 Reserve some pasta water before draining. 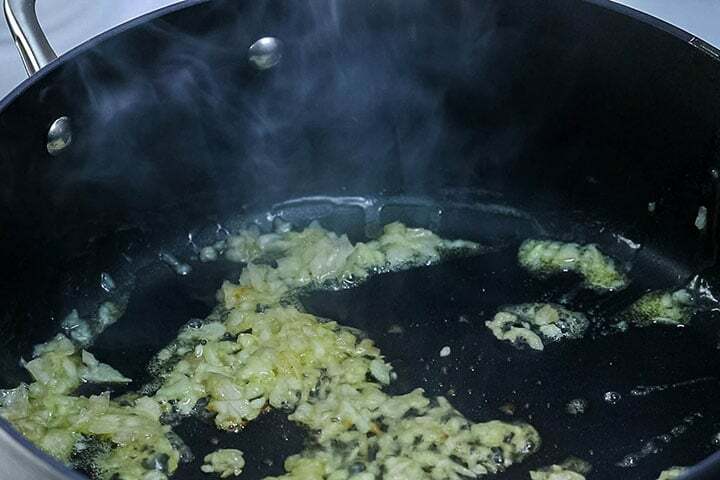 While the pasta cooks, sauté the shallots in butter and cook until transparent. Add the garlic and cook another minute. Cook until the mushrooms are fully cooked. Stir in the cream, lower the heat and simmer gently until thickened (1-2 minutes). Sprinkle with fresh parsley. Add the spaghetti and toss with the sauce to coat. If it becomes dry, add some of the reserved pasta water. Top with freshly grated cheese and enjoy every last bite! To clean the mushrooms, use damp paper towels to remove any dirt. Cleaning mushrooms with water cause them to become waterlogged. Mushrooms absorb water like sponges and they won’t brown well when cooked if they are full of water. If you want to use water, you can quickly rinse the mushrooms and pat dry with paper towels, but don’t soak them. When cooking mushrooms, don’t overcrowd the pan. 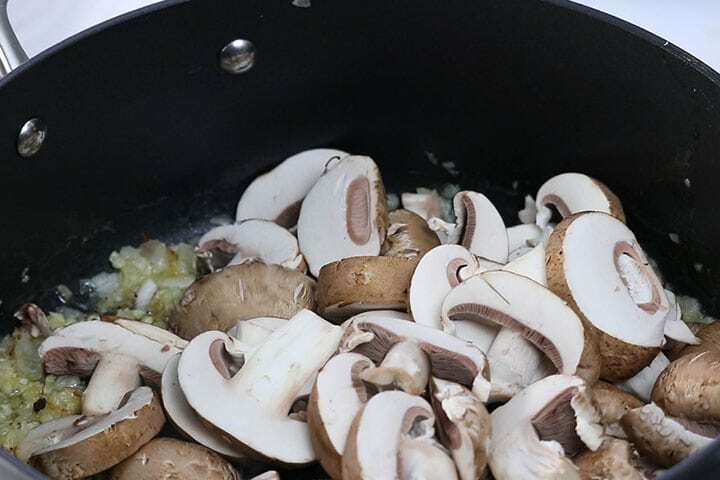 Cook mushrooms in a pan with a good amount of surface area. 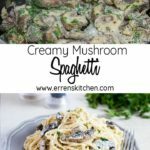 You want to be able to spread the mushrooms in a single layer to allow contact with the hot pan and let moisture evaporate quickly so they brown nicely. To add an even deeper mushroom flavor, you can add some dried porcini mushrooms (that have been soaked of course) and add a bit of the liquid you use for soaking them. Since I wanted a quick and simple dish, I went for using only fresh mushrooms. 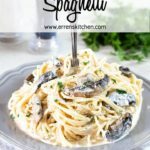 Swap Out The Mushrooms This recipe would work well with white mushrooms or baby portabellas too. For a nonvegetarian meal, add cooked chicken. Looking for something spicy? Sprinkle crushed red pepper flakes into the sauce for a creamy southwest spaghetti. Cook the pasta in a large pot of boiling water until quite al dente (it will finish cooking in the sauce). 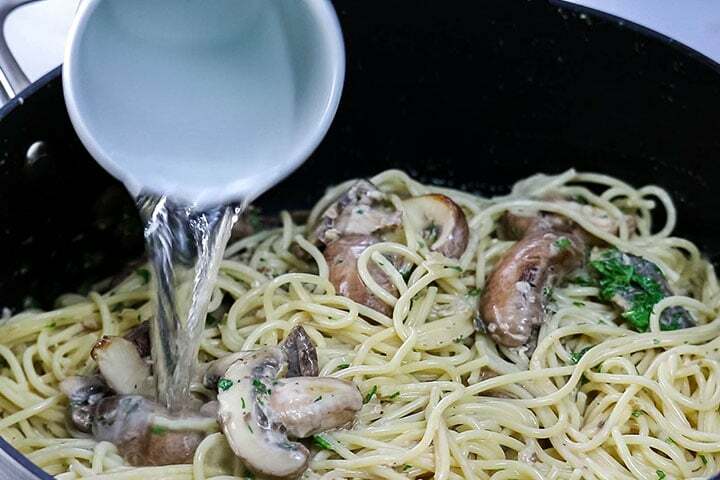 While the pasta is cooking, melt the butter in a large frying pan on medium heat. Add the mushrooms & shallots and cook until transparent (about 3-4 minutes). Add the garlic and cook another minute. Stir in the cream and parsley, lower the heat and simmer gently until thickened (1-2 minutes). Drain the pasta and reserve some of the pasta water. Add the pasta to the sauce and toss to coat, adding the reserved water as needed. Serve immediately with grated cheese. 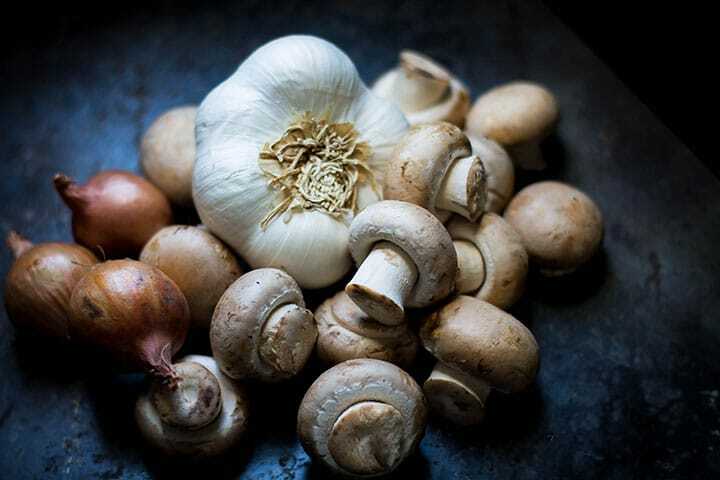 To clean the mushrooms, use damp paper towels to remove any dirt. Cleaning mushrooms with water cause them to become waterlogged. Mushrooms absorb water like sponges and they won't brown well when cooked if they are full of water. If you want to use water, you can quickly rinse the mushrooms and pat dry with paper towels, but don't soak them. When cooking mushrooms, don't overcrowd the pan. 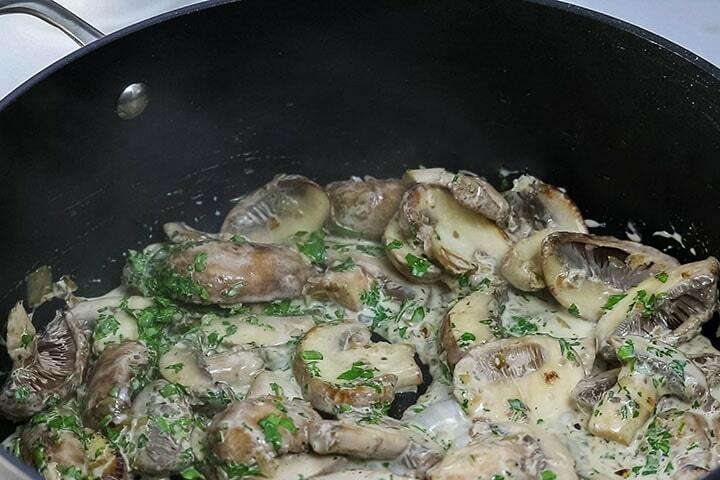 Cook mushrooms in a pan with a good amount of surface area. You want to be able to spread the mushrooms in a single layer to allow contact with the hot pan and let moisture evaporate quickly so they brown nicely. Update Notes: This post was originally published on: July 17, 2014, but was republished with step by step instructions, new photos, a video, tips, and FAQs in February of 2018. It’s been ages since I’ve had mushroom spaghetti. I need to make these for dinner one night! Yum! Sounds spectacular! This is perfect specially when we need something quick and easy, can’t wait to try! I love how light yet creamy this dish was! Perfectly filling. I served it with a side salad. I’ll definitely make this again. Thank you for your awesome feedback Sabrina! Salad as a side is a good shout! a magical plant. Thank you for sharing those mouth-watering recipe. Will surely give it a try. Amazing! We followed the recipe as written, very good! It has a nice light sauce, we’ll be making it again. Thank you! It’s always great to get such lovely feedback! Thanks so much! You are quite welcome, Adam! Thank you for the great feedback!